German Hanger brings to India one of our special tents with a very high quality materials and uses for large events we called it "Alpine Marquees" and "Alpine Tents". 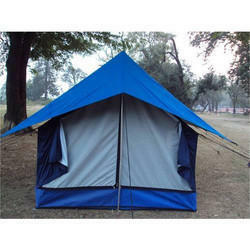 These tents are one of the most famous tents which are used around the world due to its beauty and quality. These tents comes in big tents which gives a huge seating capacity for big event. Features includes tough nylon taffeta cloth which is used to construct inner tent and fly sheet which stands on two vertical and one horizontal aluminum folding poles. These are like canvas pop-up tents which you can be pitched up anywhere in the jungle . These do not have attached bathrooms. Their bathroom are 15 feet approx away from these tents . They actual camping tents. We provide gadda's in these tents. Nature Camp having 12 Deluxe Alpine Tent Camps. All the tent camps are spacious (10 ft x12 ft), clean, having attached modern bathroom facility with comfortable single or double Bed, Pillow, Mattresses & Blankets. Occupied with LCD, Cable Connection & Wi-Fi Internet. 1. We manufacture finest quality Alpine Tents using premium Grade Light Waterproof and Breathable Nylon fabric. 2. Vibrant and Attractive color availability. Environmental Friendly Colors are recommended when trekking in forest and Jungles. 3. Anodized Aluminium Frame . 4. Tough and Waterproof Fabric used for Flooring. 5.